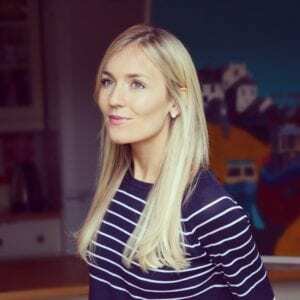 Lily Soutter is a renowned nutritionist, blogger and food writer for The Times, Cosmopolitan, The Telegraph, Women’s Health, The Independent and The Daily Mail. Because of her extensive knowledge of the science behind food and health, she often appears on ITV’s This Morning to give her expert opinion. Lily believes by providing the right education when it comes to food, everyone can achieve a greater, healthier and more energetic version of themselves. Is sugar really that bad and how much is too much? A high sugar-diet can increase the risk of developing dental cavities and diabetes. It can also lead to weight gain as sugary food and drinks tend be calorie dense. ‘Free’ sugars are typically concentrated sugars and are often added to our food to enhance flavour. They can include sources such as table sugar, maple syrup, honey, agave, coconut sugar and even fruit juices. Will sweeteners make my sugar craving worse? Whilst these claims may have made their way into the headlines, this theory isn’t based on robust evidence and hasn’t been proven. However, there are higher quality studies, such as this one (https://www.nature.com/articles/ijo2015177) published in the International Journal of Obesity, which show using sweeteners in place of sugar can actually result in lowering body weight. Are some sweeteners better for dieters than others? All sweeteners displace calories from sugar and the type or form of sweetener used in food products really depends on how well it blends with the food product and how it influences the flavour. 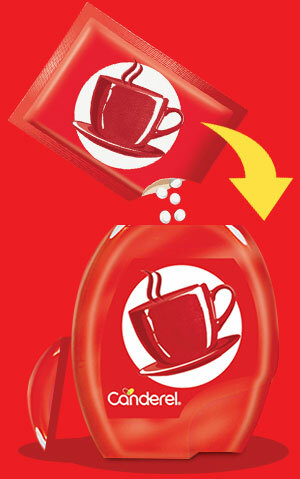 Are some sweeteners safer than others? You’ll be pleased to know all low-calorie sweeteners undergo a comprehensive and thorough safety evaluation by regulatory authorities before being approved for use within foods. In fact, each type of sweetener comes with an acceptable daily intake (ADI) level which is basically the estimated amount of sweetener we can consume per kg of body weight every day and over our lifetime without risk – which is a lot. This means that for all sweeteners used within food products, there is a large safety margin. For example, an adult would have to drink as many as 14 cans of sugar-free drink every single day before reaching the ADI – which is pretty hard to do. If there are any potential contraindications with health conditions or side effects of a particular sweetener, food manufacturers are legally bound to state this on the label. What about coconut sugar, agave and honey - are they healthier sugar sources? Coconut sugar, agave and honey are often dubbed as ‘healthier’ compared to white refined sugar. Whilst these sugar alternatives come with more nutrients, it’s important to note that you would need to consume them in relatively large amounts to impact the nutrient status of your diet. What’s the best way to prevent diabetes and maintain blood sugar levels? Whilst all carbohydrates break down to sugar, it’s only the fibre-rich and slow release carbohydrates which balance blood sugar and provide sustained fuel to the body and brain. Choose wholegrain varieties such as brown rice, quinoa, oats, skin-on potato, and opt for beans and pulses, being mindful of portion sizes. Include protein at each meal and snack. Protein helps to slow the rate at which a carbohydrate breaks down into sugar and can help to keep blood sugar levels stable. Try adding a protein-rich egg to your toast. Cut down on added sugar. 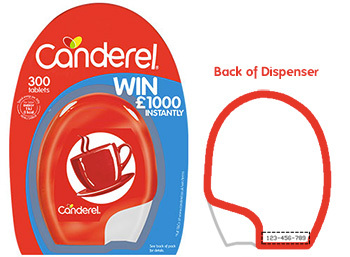 Whilst this may be hard at first, sweeteners such as Canderel can be the perfect way of enjoying that sweet flavour you love whilst cutting back on sugar. Us Brits love a cuppa, usually several cups a day. 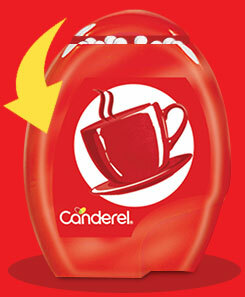 By simply swapping out the sugar and replacing it with Canderel Original tablets, you can save on calories with no effect on blood sugar levels. Everyone seems to be going vegan - is it healthy? If you are deciding to transition to veganism it’s important to consider following a well-rounded and balanced vegan diet. Any diet which cuts out whole food groups can leave us susceptible to nutrient deficiencies, therefore supplements with nutrients such as vitamin B12 should be considered. Always consult a medical practitioner before taking supplements. Is there a diet that targets stomach fat? What are your thoughts on the keto diet? Is it just another fad diet? The ketogenic diet ‘keto’ is an extremely low carbohydrate, high-fat diet and believe it or not, the keto diet was initially designed as an effective tool in the treatment of drug-resistant childhood epilepsy. There may also be other health conditions in which the keto diet may be beneficial, for example neurological diseases including Alzheimer’s, Parkinson’s and multiple sclerosis. However, the evidence is limited and more research is required. When it comes to weight loss, neither a low-carb nor low-fat diet is superior. Should I follow a low-carb diet to lose weight? Weight loss is as simple as using more calories than you consume. There is no strong research to suggest that a low-carb diet has an advantage when it comes to weight loss. Reducing portion sizes and focusing on the quality of the carbohydrates is key. We are all unique and a diet which the individual can sustain is key. Is it advisable to eat carbs at the end of the day or at the beginning? Our circadian system plays a role with how we digest sugar, fat and with energy expenditure. Research suggests that several of these rhythms peak in the morning meaning that we may metabolise carbohydrates better earlier on in the day. However research around meal timings is still in its infancy and focusing on a well-rounded diet with balanced meals is likely to have a bigger impact on health long-term. Is it ok to eat a high-fat diet now - I keep reading low-fat diets made us fat? An excess of calories in a diet leads to weight gain rather than the composition of the diet itself. Healthy fats play a key role with optimal health and are essential within our diet. It’s important to note that 1g of fat comes with 9 calories, whereas 1g carbohydrates and protein comes with just 4 calories. Therefore, fat of any sort should still be consumed in moderation and the focus should be on replacing saturated fat (butter and lard with animal fats) with healthy fats such oily fish, olive oil, nuts, seeds and avocado. Why does healthy eating seem so contradictory – what should I eat for the best? The current UK guidelines around nutrition haven’t drastically changed over the years. The main message is to follow a balanced diet which focuses on plants and grains, moderate amounts of eggs, dairy, meat and fish and small amounts of healthy fats. Media headlines can play a big role with fuelling contradictory information on nutrition. These headlines often come from small studies which have little scientific grounding. Remember that variety in the diet is key. Focus on everything in moderation and don’t get distracted by contradictory headlines or the latest fads. Quick fix breakfasts such as refined pastries, cereals and sugary coffee may give us an energy boost, but they certainly don’t keep hunger at bay. A low-sugar, high-fibre and protein-rich breakfast is the best option to keep us satisfied all morning long, minimising unnecessary snacking throughout the day. Will eating late at night make me fat? The UK is reported to have one of the highest evening energy intakes, with dinner providing on average 40% of our daily calories. When we eat isn’t really what leads to weight gain, it’s how much we eat and since we consume most of our calories in the evening, it could be the perfect opportunity to cut back. Mindless snacking in front of the TV each night is a fast track route of consuming high calorie but nutrient-poor foods. Can you recommend a good snack to hit the sweet cravings? 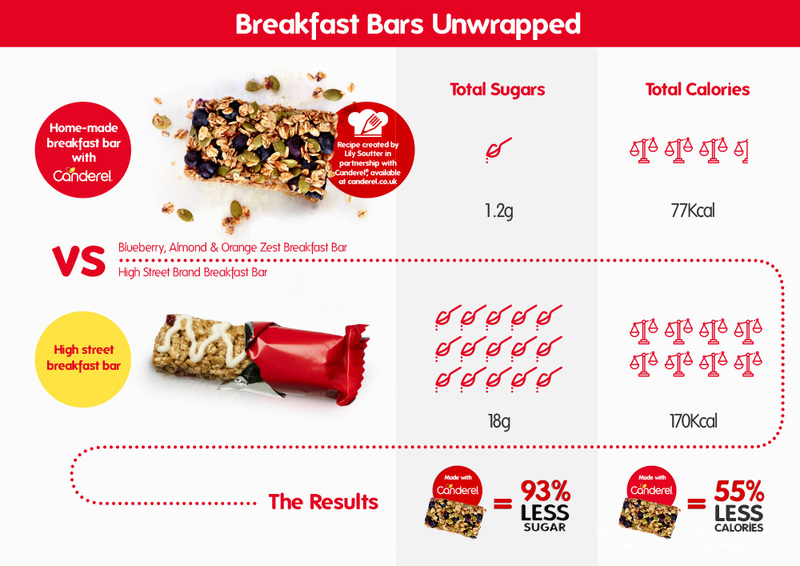 Is granola a healthy breakfast option? Many granolas are high in added sugars such as table sugar and honey. Check the labels for added sugar and if it comes high on the ingredients list, this may be one to consume in moderation. However, you could make a low-sugar chocolate granola by mixing Canderel Zero, oats, nuts, seeds, cacao powder, coconut oil and almond butter in a bowl and roasting. Enjoy with a dollop of yoghurt and your favourite fresh fruit. Can you recommend an alternative to chocolate? A deliciously indulgent yet super quick and easy to make recipe involves blending raw cacao powder, with coconut oil, almond butter, Canderel Zero and vanilla essence. Spread over baking tray and leave in the freezer for 30 minute to harden. Slice, then enjoy. We are all unique and our requirements may vary, however three balanced meals a day can help to keep us nourished and satiated throughout the day. If you are active or have long gaps between meals, then wholesome snacks can help to keep energy high. What sized meals should I be eating? • Fill a quarter of your plate with protein and healthy fats (1 palm protein + 1tbsp fat for women, 2 palm protein + 2tbsp fat for men. I hate plain water, what low-calorie drinks can I have? Hydration is key for optimal concentration, energy and even mood. Try infusing berries, cucumber, lemon, ginger and even mint in fresh water overnight for a flavoured drink. 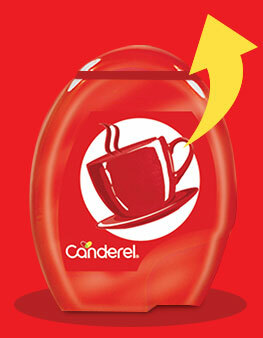 You can also make a brew of herbal or fruit tea, with Canderel Original Tablets for a tasty, yet warming hydrator.